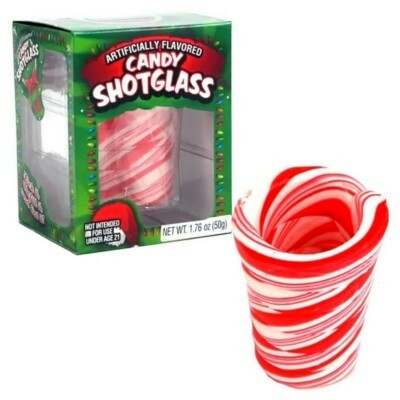 A fabulous Christmas gift or stocking stuffer, and appropriate for any kind of drink, this adorable candy cane shot glass can absolutely hold its liquor! Edible and functional, it will lend a minty flavor to your favorite alcoholic shot, as well as your tea, hot chocolate, or any other holiday drink. Raise a candy cane glass to celebrate the season and ring in the New Year! Each candy cane shotglass sold separately. Sugar, corn syrup, water, artificial flavor, colors E171-E129*. *May have an adverse effect on activity and attention in children. Contains GMO. Nutrition facts (for 100g): calories 400Kcal, total fat 0g (saturated fat 0g), total carbohydrate 100g (sugar 80g), protein 0g, salt 0.1g. vraiment agréable ! donne un air de fête supplémentaire ! bon faut se retenir de le manger trop vite et de suite en fait ;) !